Marvel Studios announced yesterday that we were all going to soon get a better look at Ant-Man and the Wasp, and they weren't kidding around. The new trailer has dropped and it's even better than the first trailer that was released earlier this year. Ant-Man 2 will be the third and final Marvel movie to be released in 2018, with Captain Marvel launching into theaters early next year. Both movies take place before the events of Infinity War, which has now been officially confirmed. The tone of the Ant-Man 2 trailer is lighthearted and far less serious than the events of Infinity War, which just came out this past weekend. It appears that the sequel will be somewhat of a palette cleanser for the Marvel Cinematic Universe after all of the recent doom and gloom, and the brand-new trailer reflects that. We are also introduced to the movie's crazy new villain Ghost, played by Hannah John-Kamen. As seen here, she has stolen some of Hank Pym's tech, and is able to seemingly walk through walls just like an apparition, with Michael Peña's Luis gleefully explaining the threat to Scott and Hank. 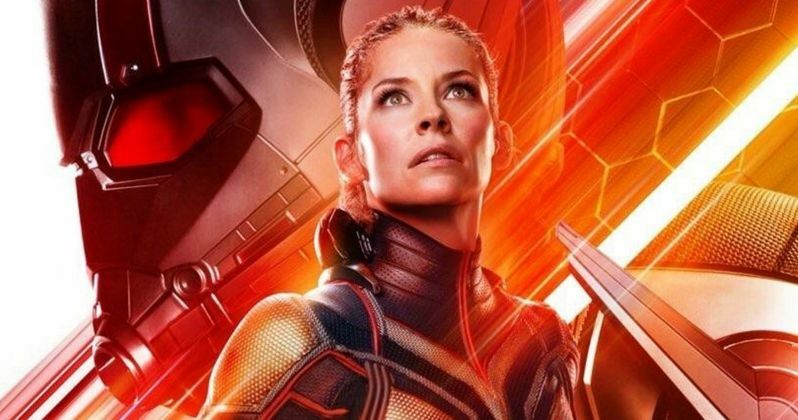 To prepare fans for the new Ant-Man 2 trailer, Marvel released a new poster that features Evangeline Lilly's Wasp character front and center along with our first look at Michelle Pfeiffer's Janet van Dyne, who has been missing in the Quantum Realm. Evangeline Lilly recently spoke about the plot of Ant-Man and the Wasp, noting that the main storyline is the search for Janet van Dyne, aka the first Wasp, mother of Hope, and wife of Hank Pym. After Scott Lang's adventure in the Quantum Realm and making it back safely, it has sparked the curiosity to go save Janet. While the sequel is not the romantic comedy of the MCU, it certainly looks like we will be getting a little bit of a love story as Scott and Hope learn to work together. In addition to the new poster, Marvel Studios also promoted the new trailer with a hilarious video of the cast of Infinity War trying to answer where Scott Lang was during the events of Avengers 3. Nobody seems to know where or what Lang was doing while they were all battling Thanos. Anthony Mackie asks where the "tic tac" is while someone mentions that he's probably with Hawkeye. As the new footage proves, Paul Rudd's Scott Lang is back at home after being placed on house arrest after the events of Captain America: Civil War. Lang wasn't lucky enough to get broken out of the Raft by Cap. This will more than likely be the final trailer for Ant-Man 2 and we'll probably get a barrage of TV spots in the coming months as the release date approaches. It will be nice to end the MCU's year with a little lighthearted fun to prepare us for Avengers 4, which hits theaters in a year from now. Ant-Man and the Wasp will reportedly play a big role in that movie as well after sitting out for Infinity War. Ant-Man 2 will swing into theaters on July 6th, until then, you can check out the brand-new trailer for below, thanks to Marvel Studios.